In the competitive marketplace of digital photography, most of the major manufacturers, including Nikon, have developed a letter-code system to help consumers understand the company’s various types of lenses and their uses. Before you purchase a Nikon lens, you should be familiar with these lens codes, so you choose the right lens to match your kind of photography and the size of your bank account. AI, AI-S: Either of these codes signifies that the lens includes an automatic indexing function, which means it is unnecessary to align the aperture ring manually when the lens is mounted. This manual alignment was required on Nikon lenses prior to 1977. Since then, all Nikon lenses have had this feature (except for G Series lenses because they have no aperture ring), even if either code is not present on the lens or a part of its description. E: This letter identifies a Nikon lens, as a Series E model, which is an economy-priced lens for hobbyists and enthusiasts. A Nikon Series E lens still provides excellent image quality, but not to the demanding standards of a professional. Various parts of Series E lenses are made with aluminum or plastic parts instead of brass, which is found on high-end Nikkor lenses. Even with their lower price, the mounts of Series E lenses are entirely made of metal, which speaks to their durability and value. D: Nikon lenses with this letter in their name indicate that they are linked with the camera to provide focus distance information. This aids users with 3-D matrix metering and flash photography. G: Lenses with this designation lack an aperture ring. In G lenses, either the camera sets the aperture automatically or the user must press and hold the EV/Aperture button while turning the command dial (on the D50 camera). 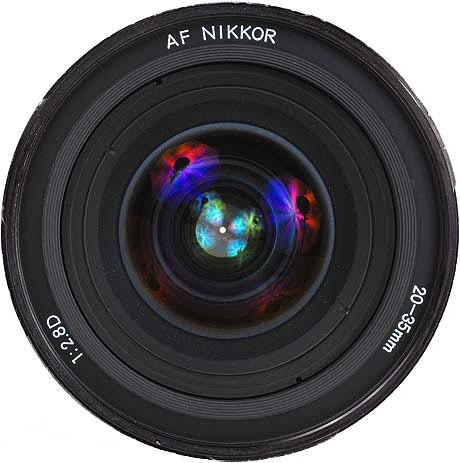 Nikon G lenses are not compatible with older camera models that have an aperture ring. AF, AF-D, AF-I, AF-S: In this two-part code, AF denotes the lens as having an auto-focus feature. The second part of the code further defines the lens: D is for a D-type lens (see above); I is for lenses that focus with an internal motor; S lenses focus or fine-tune focus manually, even with AF operating. DX: Nikon DX lenses are only compatible with digital cameras featuring the 1.5x crop factor. These cameras produce an image with dimensions that are smaller than the standard 35mm frame. If a full-frame lens were used, then part of what it sees would not register on the sensor. Since DX lenses are digital-only, they tend to be smaller and weigh less than an equivalent full-frame model. VR: Nikon’s image stabilization technology is called Vibration Reduction. With this capability, the glass elements within the lens adjust to offset camera movement. Photographers are able to shoot at longer shutter speeds without a tripod. ED: Some Nikon lenses are made with elements of Extra-low Dispersion glass. This helps to lessen the effect of chromatic aberration and other distortion factors. Some lenses may have a LD marking for low dispersion, while others will display UD, meaning ultra-low dispersion. Micro: Nikon’s uses this word to describe its macro lenses. IF: Nikon lenses with this code focus internally. All movement to achieve the proper focus occurs within the lens, so the exterior of the lens doesn’t change in length. IX: Nikon designed and manufactured lens with this code specifically for its Pronea APS film cameras. Although these cameras could also accept many of Nikon’s other lenses, the IX lenses are not compatible with other Nikon camera bodies. DC: This designation indicates that the Nikon lens has defocus control. This function alters the look of the areas of an image that are not in focus. Portrait photographers and those shooting macro photography benefit from the use of these lenses.